We were invited to the Buildings Alive! Ybor City Architecture Hop, and while I knew this event would be interesting – my love for “old buildings” was definitely taken to a new level in my own backyard. The hop started in Centro Ybor at the building once known as El Centro Espanol de Tampa (est.1912), which now houses Carne Chophouse and Florida Business Interiors (second floor). We learned the building once served as a mutual aid society with an elegant ballroom, theater, libraries, gym, cantina and a low-cost health care facility for Spanish immigrants drawn to the area by the cigar industry. Members of the club paid only $.15 per month to be a member – what a deal for health care! El Centro Espanol’s 102-year-old features are something to notice – the ceiling is beautifully done and the floor tiles are original. Another interesting fact: this building is one of two National Historic Landmark buildings in Tampa. The only other one is Plant Hall at University of Tampa, the former Tampa Bay Hotel. Non-historic side note: the deviled eggs and $2 Finlandia Vodka martinis at Carne Chophouse are to-die-for! We then moved onto Don Vicente de Ybor Historic Inn and received a one-of-a-kind and attention-grabbing tour by the owner, Jack Shiver. We heard top-secret ghost stories and learned the staircase is the only original feature (est. 1895) leftover from the fire that destroyed the former clinic. After an extensive $2 million renovation, the grand staircase has been meticulously restored and the Inn has 16 hotel rooms and is a beautiful wedding and event venue. The Cuban Club, also known as El Circulo Cubano, was our third stop. 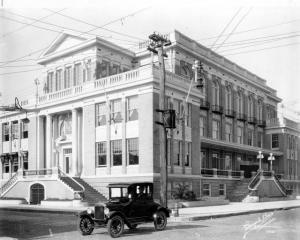 Opening in 1918, the building served as a community club for Cubans in Tampa and is now a stunning event venue. The separate rooms for men and women & children still remain in the foyer, and we learned how women were not allowed in the lavish ballroom on the third floor. The basement – now part of the building’s event venue – was formerly the gym and doctor’s office, and the doctor’s information still remains as a shadow on the door. Organized by the Ybor City Museum Society, other stops included USAmeriBank, in the former Columbia Bank building; Design Styles Architects, previously a neighborhood grocery store called Spoto Paolo & Co. Gros. 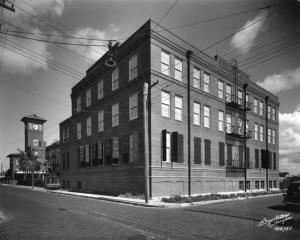 in the 1930s; J.C. Newman Cigar Factory, built in 1910 and one of the only cigar factories still remaining in Tampa; TMD Windows & Doors, originally home to the Ferlita Macaroni Factory through 1936; and Ybor City Museum State Park, which is housed in what was once the Ferlita Bakery. Each stop provided refreshments and hors d&apos;oeuvres – and could be reached by walking down the historic streets of Ybor City or hopping on the trolley. 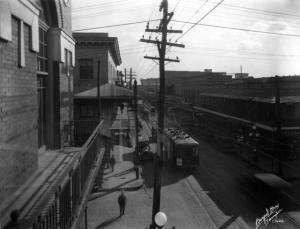 The Architecture Hop was truly a unique event and a great way to learn about Ybor City’s history.